Treat baby to some poppin’, droppin’ funtime with this air-powered activity set. Our family is living in furnished apartment while we transition to a new house. Most of our toys are in storage. I bought a selection of toys to keep the boys (age 3 and ten months) in our small space. This toy is such a hit. Both boys like it. My ten month old is fascinated. He has played with it off and on all day long every day this week. I watch his coordination improve as he figures out how to start the music, etc. It’s just wonderful fun! My daughter owns this and LOVES it! She shrieks with delight as the balls pop up in the air and roll around and around. There is so much action going on. Air powered. I can see this toy will really help build her hand-eye coordination and problem solving skills, not to mention keeping her entertained for hours. I’ve never seen her enjoy a toy this much before! Very simple toy. Works on a pneumatic system. There is a ball popper, ball cage and three accessory systems. It also has very good battery life. I wish they had given some extra balls. Once the ball is dinged it wont work well. Iam unable to find other balls that fit in the poper. Overall a very good toy, buy when it is on sale. 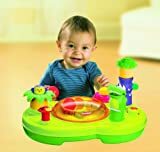 My son loved his Tiny Love mobile, and I thought the activity center would be a nice replacement when he grew out of it at 5 months. Well, not so much. The supposedly simple side for younger babies features a musical smiley face button and a squeaker that require LOTS of force to make them work. My son is now 7 months old and he still can’t operate them. (But he CAN use the little squeaker on the other side!) The knocker with the rattle also needs a lot of force, and even if you do manage to move it, it hardly produces any sound as it only moves a fraction of an inch. The two spinners are great and he loves those, but you can get those on any activity center. The unit is quite tall, and so far, whether lying in his playpen or sitting on the floor, he can only reach these bottom two toys. On the other side, the toy that pops out and giggles is a lovely idea but we just can’t get that door close and STAY closed. I went to a store and tried every one on the shelf and they all had the same problem. So he can’t play with that feature either, really. And you need to move the lever for the spinner just so, at the right speed and with the right amount of force if you want the disc to spin. Then, most disappointing of all, there’s the music. The horrible, frenetic, tinny, nasty music that was such a shock after having the Symphony in Motion mobile. It sounded so bad that I was sure the batteries had run down, but even after replacing them it sounds the same – cheap and incredibly irritating. As did all the other models in the toy store. On the plus side, the toy is really solid, made of good quality plastic, and the colours and the design are lovely and bright and attractive. It’s outrageously expensive – I live in Europe so we paid about for it – especially considering most of the activities are useless. I’m quite annoyed that poor old Grandad shelled out so much money for it, and didn’t keep the receipt. We actually get more fun out of the old FP activity center we bought on ebay for a couple of dollars to keep at Grandma’s. Lesson learned – new and expensive isn’t always best! My wife bought this Activity Center because we love the Tiny Love toys, and with this one we were not disappointed. Our son plays on this for hours, both sides. We were somewhat disappointed that more than just two songs are available, and after time, you will be humming them in your sleep. The only concern I had with this toy was the two small yellow plastic loopholes on the bottom of the toy. While flipping it over, hung or not on his pack and play, one of my son’s fingers would get stuck in the hole and he could not figure how to remove it – tight fit. He would then panic and bend his finger back, causing him to cry out in pain or distress. I removed the loops and filed them down so this would not happen again. Not sure why they are there. Despite this, this is a great toy. – the most i don’t like in this toy (both sides) is the music of those 4 musical instruments buttons. It sounds not like it’s a baby toy but like it’s some kind of tool to horrify the baby. We have pretty much musical toys and none of them has the music which is soooo unpleasant. My baby just looks at tose buttons as she looks at strangers she doesn’t like. – pop-up thing – could have a better holding door (opens easily) and prettier “animal” inside. – the squeaky knob on this side is hard to push even for me. To summarize i’ll just say that as for me even 2 sides are not worth the money! I don’t like it at all!